The CS1504 bar code scanner has compact, go-anywhere design that allows it to fit into a purse or onto a keychain. Using the device is simple: just point, click and scan. It captures and stores up to 150 1D barcodes and the data collected can be downloaded via USB or RS-232 to the host computer. The CS1504 is ideal for low volume simple data capture applications that do not warrant all the features and programming requirements of a mobile computer since there is no user interface, no screen and no keypad. Fits onto a key chain, easily carried in pocket or purse. Means the user just points, clicks, and scans. Each bar code is stamped with time and date to assist with data mining or organizing specific tasks. 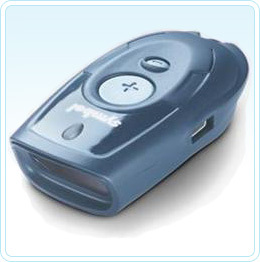 Retains scanned data even when batteries are removed or lose power. Easily connects to legacy and newer host systems by simple cable switch. Scan and Delete buttons add or delete data. Data Protection Mode locks Scan button to prevent accidental deletion or addition of data. Disable Delete Function disables the Delete button via host command.